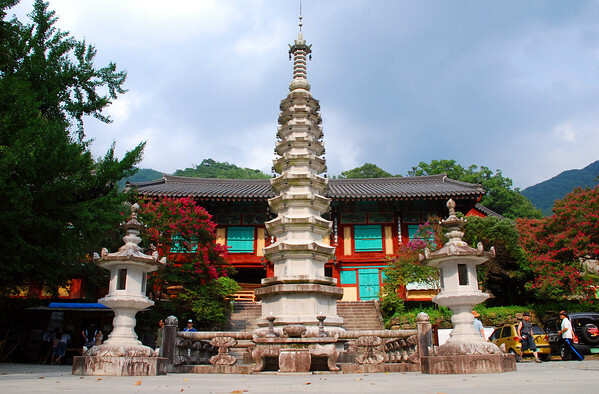 Sunday Photo; Pagoda at SsangGye Temple – Wake Up and Laugh! They further asked, “In the future, there won’t be any difficulties, will there? The officials will be Yang and Liu. Five or six years after the Master’s death, a Korean monk named Chin Ta Pei hired Chan Ching Man of Hung Chou to steal the Patriarch’s head and bring it back to Korea so that he could make offerings to it. Being poor and hungry, Chan Ching Man accepted the money. The Patrirch’s head was originally buried beneath the Main Hall, but after it was burned down and rebuilt, the head was enshrined inside the pagoda. Yet another beautiful photo/setting. Makes me want to go back to Korea. At Nanhua Temple in Southern China, the mummified body of the Sixth Patriarch sits enclosed in glass on an altar – complete with his head. So which is the true head of the Sixth Patriarch? Maybe they’re both the true head! If I ever visit Nanhua Temple, I’ll take a close look at the Patriarch’s neck! Actually, that’s a good question. Because if the monks at Nanhua Temple lost the Patriarch’s head, the emperor might have chopped off theirs. (Having been charged with looking after the remains of such a precious being.) So they’d have been motivated to find (carve?) a replacement. The body has been laquered, so it might be hard to tell. So, I have no idea! But it seems like either case might be possible. Does the fact that it’s on display raise any suspicion that there might be something to hide? This question – which one is the true head of the sixth patriarch? – might go in a different direction. Perhaps the true head is closer than you think!